The Cincinnati Bengals and tight end Tyler Eifert recently agreed to a one-year, incentive-loaded “prove-it” deal. The move is favorable for both sides, as Eifert gets the chance to prove that he can remain healthy and return to his dominant 2015 form, and the Bengals get to retain one of the league’s premier red-zone weapons for a low-risk bargain. If Eifert can manage to stay healthy, he could combine with A.J. Green and Tyler Boyd to form one of the league’s most underrated passing attacks. The caveat with Tyler Eifert has always been his health. He has the reputation of another talented, but an oft-injured player who will never be able to sustain the flashes of greatness for more than a season. However, it is important to really look closely at Eifert’s injury history before writing him off entirely. Yes, he missed three games in 2015 with a neck stinger and a concussion. He even lost four games in 2016 with a back issue, which then turned into a surgery that caused him to miss 2017. The injury history is concerning, but many also assume that his two other missed seasons are a result of him being injury-prone when that isn’t necessarily true. Eifert lost his 2014 season in the first quarter of the first game when he dislocated his elbow, and most recently lost his 2018 season to a nasty dislocated ankle in Week 4. Both were freak injuries that could have happened to any player who landed the wrong way, and in these instances, you can make the case that Eifert was just extremely unlucky. Assuming Eifert can stay healthy, there is a mountain of evidence that suggests he would provide a boost to the Cincinnati offense—especially in the red zone. In 2015, Eifert played in 13 games and drew 66 targets, but he still managed to reel in 13 touchdowns, and earn a 90.1 receiving grade that ranked third among players at the position. The play below demonstrates how deadly Eifert can be in the red zone when he’s at his peak, as he sells the juke to the outside and uses a savvy swim move to slip past the smaller Brandon Flowers for the easy touchdown. When looking at his red-zone numbers, Eifert’s impact on the field is even more apparent. 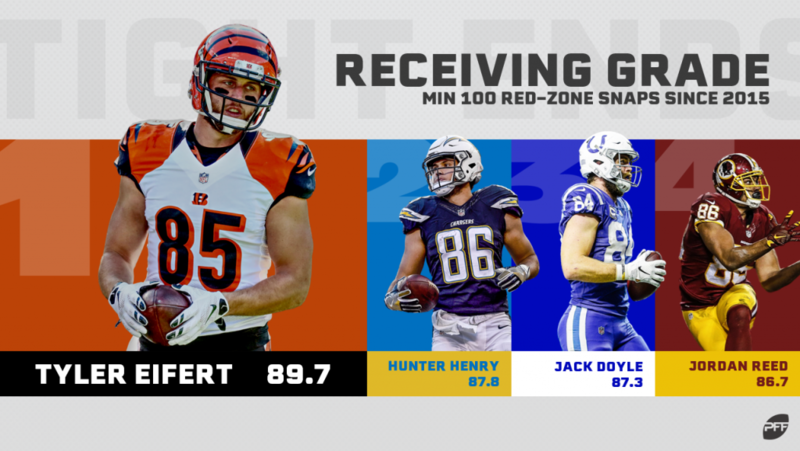 Among tight ends with at least 100 red-zone snaps since 2015, Eifert’s receiving grade of 89.7 and average of 1.61 yards per route run both rank first. When you look at all Bengals receivers in the red zone with at least 10 targets since 2015, you see that Eifert’s 103.6 wide receiver rating ranks second behind only Tyler Boyd (131.5). Even after missing all of 2017 due to his surgery, in four games Eifert managed to grab 15 of his 18 targets for 179 yards and a touchdown. Among tight ends, he tied for 10th in yards per route run and 11th in overall grade before suffering the dislocated ankle. The week before his injury, Eifert seemed to be shaking off the rust, catching six of his seven targets for 74 yards and six first downs, en route to an 87.0 overall grade. If the first few weeks of last season were any indication, and he can recover fully from the dislocated ankle, there’s no reason to believe Eifert can’t still be a lethal receiving threat. When you consider pairing him with a budding talent in Tyler Boyd and consistent, top-level receiver in Green, things get interesting. Boyd was exceptional on money-downs last season, with 58.1% of his money-down targets went for a first down or touchdown, which ranked eighth in the NFL. He was one of the best receivers in the NFL in the slot, averaging 2.00 yards per route run (12th) when lined up in the slot, and was sixth in passer rating when targeted. If you needed any convincing of how consistently Green produces at a near-elite level, he has four seasons with an overall grade of over 85.0 and has averaged over 2.00 yards per route run every season of his career. If Tyler Eifert can manage to stay healthy and even slightly resemble his 2015 Pro Bowl form, you can rest assured that he will pair with Tyler Boyd and A.J. Green to form one of the league’s most potent passing attacks.